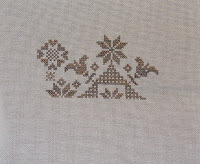 This is Quaker Seasons of Frindship by R&R Reproductions. 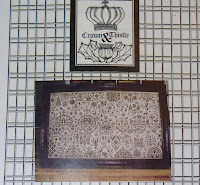 I'm stitching it on 32 count White lugana with Wattle n' Daub by Vikki Clayton HDF. I started in the middle instead of in the upper left corner. Nice start! Can't wait to see more. Great start Amanda.. I cannot wait to see this grow.